That requires a combination of decision making, interventional and endovascular skills, critical care support, microsurgical skill, and advanced surgical technology. We are able to manage successfully many complex cases which are not accepted at many centres of excellence. A 17-year-old girl, computer science student, has been suffering from headaches. She has been taking treatment from various clinics without a correct diagnosis. When she got worse she had a brain scan and was then referred to Indo American Hospital. 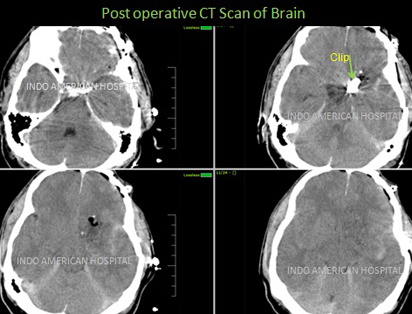 CT Scan brain showed a clot in the brain and was investigated further by the Interventional Neuroradiologist to identify the cause of the bleed. 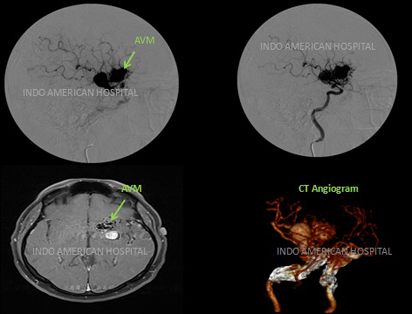 A Digital subtraction angiography (DSA) was done and she was found to have a condition called Arteriovenous Malformation with prominent pseudo aneurysm noted within the nidus. The case was discussed among the team of experts. 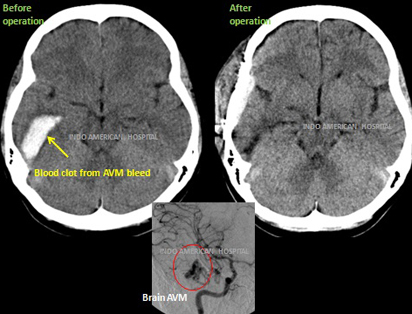 She underwent excision of the AVM through a small opening in the skull and had complete recovery. She is back to her college now without any deficits. Case 3 : Arteriovenous malformation (AVM) with Internal Carotid Artery Aneurysm. . .
A 48-year old right handed man had been suffering from severe headache, vomiting, facial deviation and mild right side weakness for few months. He took pain killers for some time and when his condition got bad they got a brain scan. He was diagnosed to have an AVM located at a critical location the controls speech and right side functions. He was referred to Medical College and then to an Institution. However doctors were reluctant to admit him and do the treatment probably due to the critical location and size of the AVM. The condition was complicated due to presence of a large wide neck internal carotid artery aneurysm and large venous sac located at speech area and there were multiple feeders from middle cerebral and anterior cerebral arteries. The chances of right side paralysis and loss of speech function were very high in this case. Finally the family brought him to Indo American Hospital. 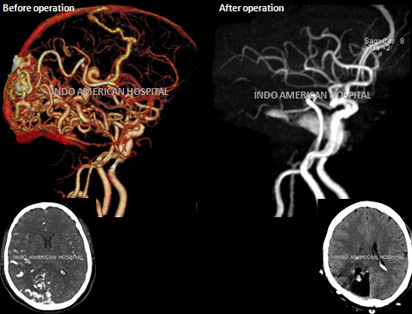 Our Interventional Neuroradiologist performed a Digital Subtraction Angiography (DSA), an MRI brain and a CT angiogram. Our team discussed the case and it was decided that, if performed well, surgery is the best and least expensive way to treat this condition. 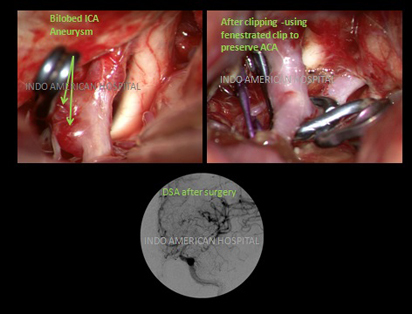 He underwent clipping of ICA aneurysm using two permanent Titanium fenestrated and straight clips (picture) and excision of AVM including the venous sac. Post-operative check DSA was done which showed filling of all vessels, a small tortuous lenticulo-striate residual AVM (picture) and well clipped aneurysm. Post operative CT brain showed no complications. After surgery patient had no paralysis and his speech was normal. He was discharged after a week.